The Tennant 3640 is an industrial grade, self-propelled, walk-behind sweeper, manufactured in the United States of America. With all the options available on the model 3640, it is also the most versatile walk-behind sweeper. This is the only sweeper to incorporate a transaxle with three forward speeds, reverse, neutral and park. Due to its rotationally molded frame, the 3640 uses fewer parts than most other sweepers in its category. When you are choosing floor cleaning equipment, fewer parts means fewer things to go wrong. The design of the 3640 also means no tool broom replacement, and no need to adjust the brooms as they wear! All of the controls are within easy reach for the operator. You can also adjust the control handle to match operator height. The optional hopper dump assist handle incorporates wheels to roll away the hopper for easy dumping. 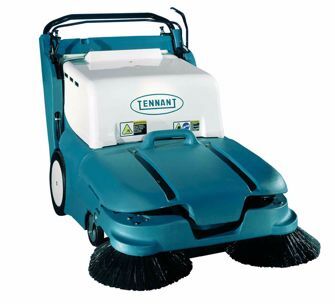 The Tennant 3640 is available with optional dual side brooms for a category leading 40 inch cleaning path. Add the optional vacuum wand and clean tight corners and hard to reach areas. When you outfit your 3640 with the high-capacity filter bag, you no longer have to deal with the hassle of a panel filter. The 3640 can sweep a wide range of debris from sand to light litter. When outfitted with an outdoor package (wide pneumatic tires and larger front casters) the 3640 sweeps uneven surfaces.